Motorcycles represent only 1.5%of insured BC vehicles, but 10% of all road fatalities. Most crashes occur during daylight, on clear days with dry roads. Car/motorcycle crashes often occur when a car turns left in front of a motorcycle. Common cause – The oncoming car driver does not see the motorcycle. Single vehicle motorcycle crashes typically occur at curves in the road. The motorcyclist usually enters the curve too quickly for their level of experience. Young riders are at the greatest risk. Over the past 10 years, 25% of motorcycle fatalities were riders aged 16 to 25. Their fatality rate was 1,200% higher than that of riders over age 25. 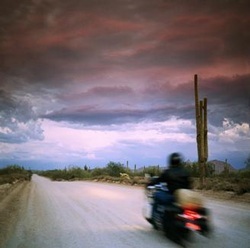 Motorcyclists are 20 times more likely to be killed or injured in a crash. Motorcycle engines are more powerful and capable of more intense acceleration and speed. Riders are not surrounded by 1200 kg or more of protective metal, as are vehicle drivers, and they don’t have seat belts and air bags to protect them. Ride like you are invisible – Don’t assume other drivers can see you. Watch out for left-turning vehicles- Don’t assume they will wait for you to drive through. Dress as if you plan to crash – Wear appropriate gear to maximize protection. Ride at appropriate speeds – Ride within your comfort zone, especially on curves. Learn and practice – Take a course – for new or experienced riders. Practice your handling skills in a safe location. Stay focused – Keep your attention on what lies ahead, not on what just happened. Ride sober – Alcohol and drugs affect your judgement and ability to react safely. Obey the rules of the road and be courteous – Ride in a predictable fashion; that’s what other drivers expect. For more information, check out BCAA Traffic Safety Foundation website at www.bcaatsf.ca .